How zebrafish pigment cells develop, differentiate and organise themselves into their famous stripe pattern has interested researchers from a developmental and evolutionary perspective for decades. There are three pigment cell types in zebrafish: black melanophores (analogous to mammalian melanocytes) yellow xanthophores, and silvery iridophores. All three lineages are derived from a common neural crest (NC) progenitor, and during development they proliferate and differentiate to pattern the embryo. In post-embryonic stages, embryonic xanthophores proliferate and enter a ‘cryptic phase’ where they lose their visible pigmentation. Later, during stripe formation, they re-differentiate and regain their pigmentation. Adult melanophores and iridophores however, are provided from a post-embryonic stem cell pool. 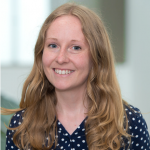 Previously, the Parichy lab showed how alterations in thyroid hormone (TH) levels disrupted post-embryonic pigment cell development and patterning. Fish lacking TH because of transgenic thyroid ablation or genetic mutation lacked visible xanthophores but had supernumerary melanophores. In this preprint, Saunders et al explore two hypotheses that might explain the mechanism of this opposing action of TH on melanophores and xanthophores – 1) that TH influences cell specification and directs multipotent cells from one fate towards the other, or that 2) TH has a discordant effect, selectively amplifying one lineage whilst repressing the other. From preprint Figure 2: Single cell transcriptomic identification of post-embryonic NC-derived cell types from euthyroid and hypothyroid fish. These analyses also enabled the identification of novel iridophore and xanthophore markers and gave some surprising insights into the distribution of well-known lineage markers – for example, the melanophore master regulator transcription factor mitfa is also expressed appreciably in xanthophores. Next, cells were ordered pseudotemporally to investigate how transcriptional dynamics change during pigment cell lineage maturation from a common progenitor. Branched expression analysis modelling (BEAM) analysis confirmed that genes involved in lineage specification such as mitfa were expressed early in pseudotime, whereas those like dct involved in differentiation were expressed later. Interestingly, this analysis also revealed the differential expression of many novel genes at different points in pseudotime, suggesting that they may be important for discrete steps in lineage-specific maturation. So, how are these processes influenced by thyroid hormone? 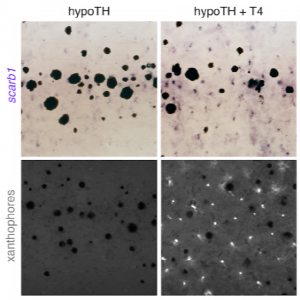 The authors’ first hypothesis that TH directs cells away from one fate and towards the other was rejected, because the clusters and trajectory topologies of euthyroid and hypothyroid cells were equivalent, and there was no evidence of either lineage being depleted. The second hypothesis of ‘lineage discordance’ was also disproved, as the distribution of both melanophores and xanthophores were biased towards early pseudotime in hypothyroid fish, arguing against a model where TH promotes xanthophore differentiation while blocking melanophore differentiation. These findings led the authors to consider a third hypothesis, that TH might promote the maturation of both lineages, but in different ways to produce the observed differences in cell numbers in hypothyroid fish. Indeed, melanophores in euthyroid fish were more likely to be binucleate and have increased lysosomal staining, both of which are characteristic of terminally differentiated melanophores. This experimental evidence, supported by increases in the expression of melanocyte maturation signatures over pseudotime in the scRNA-seq data, suggests that TH promotes melanophore maturation. From preprint Figure 6, supplement 3. Scarb1 mutants lack mature xanthophores as shown by a lack of carotenoid autofluorescence. However, this is rescued within two days after the addition of exogenous TH (T4). Therefore, the authors concluded that during xanthophore maturation, TH regulates a switch to primarily carotenoid-based colouration and is therefore required for xanthophore re-pigmentation during adult development. Taken together, this confirms the authors’ third hypothesis, that TH promotes the maturation of both xanthophore and melanophore lineages. Without TH, melanophores derived from the post-embryonic stem cell niche are stuck in a transit-amplifying phase, and cryptic xanthophores poised to re-differentiate cannot activate carotenoid pigmentation. 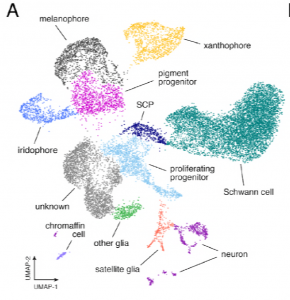 Recent single cell RNA-seq based papers in the zebrafish have been really useful in exploring the intricacies of gene expression dynamics as cells commit to specific lineages and differentiate during early zebrafish embryonic development. However, not as much is known about post-embryonic zebrafish development, including how pigment cell lineages continue to be regulated at the transcriptional level. Therefore, I was drawn to this preprint even without the hypothyroid aspect of the work. I also liked how their RNA-seq analyses uncovered a new “pteridine-to-carotenoid switch” in maturing xanthophores which was backed up really nicely with experimental work. This is probably well outside the scope of the paper, but I find it really interesting that xanthophores utilise two different pigment bases to make yellow pigment at different stages of development. Are these two yellow colours different shades, and what might be the evolutionary advantage of having two ways of pigmenting xanthophores? It is surprising to me that pteridine production does not noticeably compensate for a lack of carotenoids. Figure 3 supplement 1 shows there are distinct subpopulations of xanthophores. Do these populations cluster on whether TH is present, or if carotenoid or pteridine-associated genes predominate, or if they are pigmented or cryptic? Connected to this, how does one characterise or visualise a cryptic xanthophore, assuming they do not autofluoresce – do they have a distinct transcriptional signature to pigmented xanthophores? In the hypothyroid phenotype, it looks like melanophores encroach into the xanthophore interstripe domain instead of proliferating within their normal stripe region – do you see TH affecting genes involved in pigment cell migration/patterning or lateral inhibition? Budi EH, Patterson LB, Parichy DM. 2011. Post-embryonic nerve-associated precursors to adult pigment cells: genetic requirements and dynamics of morphogenesis and differentiation. PLoS Genet 7:e1002044. McMenamin SK, et al. 2014. Thyroid hormone-dependent adult pigment cell lineage and pattern in zebrafish. Science 345:1358–1361. 1.This is probably well outside the scope of the paper, but I find it really interesting that xanthophores utilise two different pigment bases to make yellow pigment at different stages of development. Are these two yellow colours different shades, and what might be the evolutionary advantage of having two ways of pigmenting xanthophores? It is surprising to me that pteridine production does not noticeably compensate for a lack of carotenoids. The carotenoids are more orange than pteridines, which are yellow or even clear in visible light, so there could be a difference there. It’s important also to remember that zebrafish are tetrachromatic and can see in the UV range, and these pigments have different reflectances there as well, raising the possibility of signaling between fish that we can’t actually see ourselves. 2.Figure 3 supplement 1 shows there are distinct subpopulations of xanthophores. Do these populations cluster on whether TH is present, or if carotenoid or pteridine-associated genes predominate, or if they are pigmented or cryptic? Connected to this, how does one characterise or visualise a cryptic xanthophore, assuming they do not autofluoresce – do they have a distinct transcriptional signature to pigmented xanthophores? The two subpopulations are still evident in TH- fish. One population, that we believe corresponds to cryptic X (xan 1), has lower gene expression overall and particularly low expression of carotenoid genes as compared to the other (xan 2). We believe, but still need to test in the future, that xan 1 are relatively quiescent because they are not receiving Csf1 that is provided by interstripe iridophores (Larissa Patterson’s 2013, 2014 work). There are also a number of other transcriptomic differences between xan1 and xan2 relevant to membrane biology and a couple other characteristics, but we are just beginning to explore this with new scRNA-Seq for deeper sampling of these and other pigment cell lineages. In TH- fish xan1 and xan2 are still detectable as clusters but xan2 now have reduced carotenoid gene expression, so converging towards xan1 but still retaining other distinctions. Conveniently for us, both xan1 and xan2 express aox5 and aox5:GFP even though pteridines themselves don’t contribute that much to the visible post-embryonic pigmentation. 3. In the hypothyroid phenotype, it looks like melanophores encroach into the xanthophore interstripe domain instead of proliferating within their normal stripe region – do you see TH affecting genes involved in pigment cell migration/patterning or lateral inhibition? There are some of these affected and we are in the midst of screening candidate “interaction” genes by CRISPR, etc., some of which are TH-dependent and some not. We are also doing a lot of work right now to assess whether TH effects are direct or indirect. For example, the presence of melanophores in the “interstripe” could indicate that TH normally acts on the melanophores themselves to keep them out of there, or that it has an indirect effect on melanophores via xanthophores, iridophores, or other cells. These are fairly complicated issues to sort out, as you might imagine.